"Unlock the Windows of Heaven! - Don't Take Years to 'get this' like I did. I wasted so much time!" Man! I wish I could re-do some of my embarrassing history. I was so opinionated about things when I was a young man! And I was SO WRONG ABOUT SO MANY THINGS. SPECIFICALLY: I only wish someone would have said, "Steve, sit down and listen to me! You need to GET THIS! "Steve, you pray all the time, 'Lord, Your Kingdom come! Your will be done. On Earth as it is in Heaven.' Right??" "Of course, I pray that." "Why do you pray like that?" "Why? Because I want God's will to be done perfectly on earth just as it's done perfectly in Heaven!" "Steve, Heaven is the PARADISE all mankind hopes for. Streets of Gold! Mansions for everybody right?" "Then why do you think God wants you to be poor so you can be humble? If that is how God keeps people humble, then all of Heaven would be poor, right?" "Oh... Uhh... I never thought of it like that!" 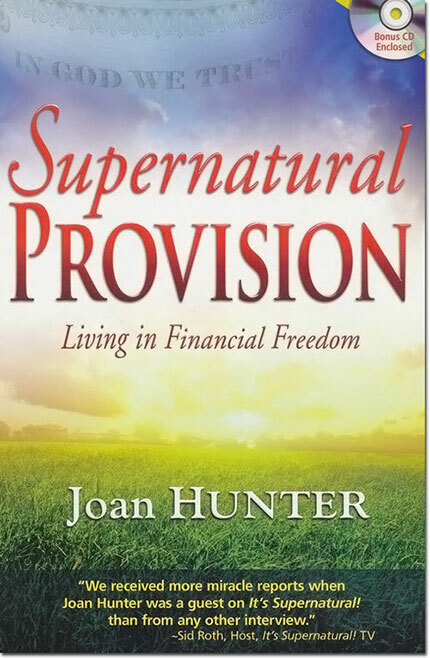 ...Joan has one of the most wise, balanced and Scriptural understandings of how God wants to give HIS KIDS this... "SUPERNATURAL PROVISION." God wants to give you an abundance of prosperity so that your income spills over, allowing you to generously give for any and all needs. But don't take my word for it. What does the Word say? "And God is able to make all grace [every favor and earthly blessing] come in abundance to you, so that you may always [under all circumstances, regardless of the need] have complete sufficiency in everything [being completely self-sufficient in Him], and have an abundance for every good work and act of charity." * While many others are in the midst of adversity, YOU WILL PROSPER!! * You and your family can now THRIVE, even if times become more "uncertain." * Simply, WALK IN GOD'S ABUNDANT BLESSINGS THE REST OF YOUR LIFE! * Finally — have all your needs met, and a great deal more! Joan Hunter has been traveling for the past thirty years ministering healing in churches and arenas all around the world. She has also been featured on such television and radio shows as Sid Roth's It's Supernatural!, It's a New Day, The Miracle Channel, Steve Shultz's Prophetic.TV, and many others. Joan's television appearances have been broadcast around the world.